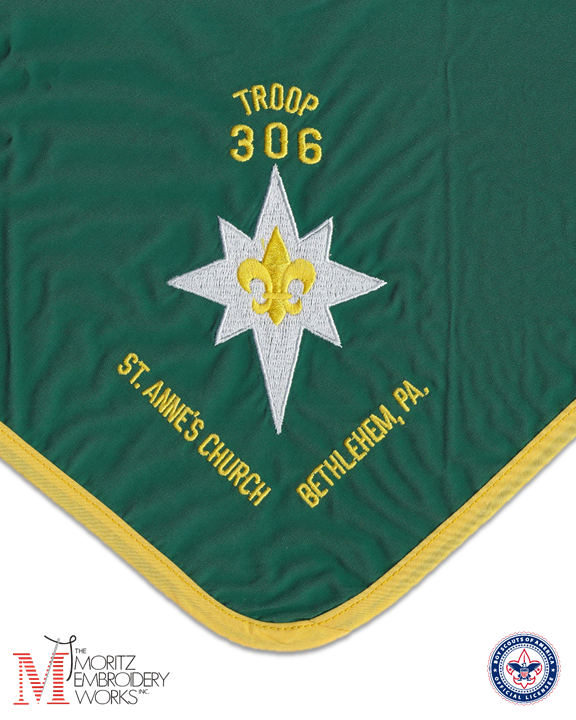 The neckerchief has been a symbol of the Scouting movement around the world for generations. 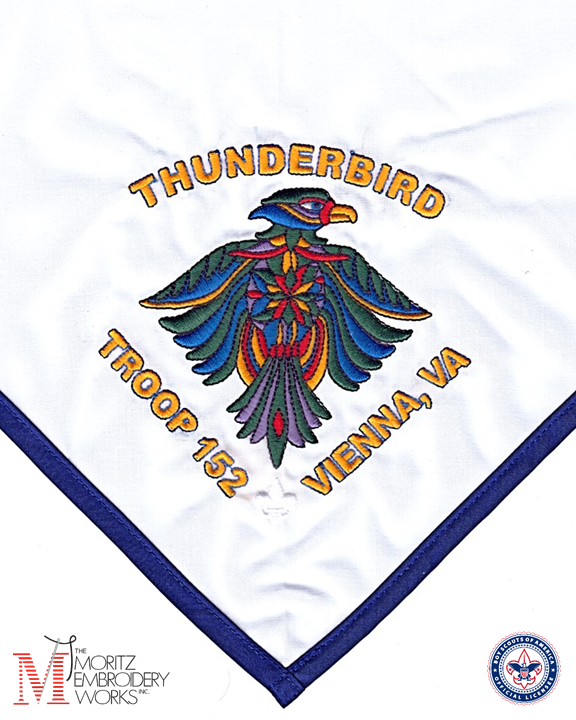 The Moritz Embroidery Works takes great pride in being one of the most experienced neckerchief manufacturers and the leading quality BSA licensee for custom Scout neckerchiefs. 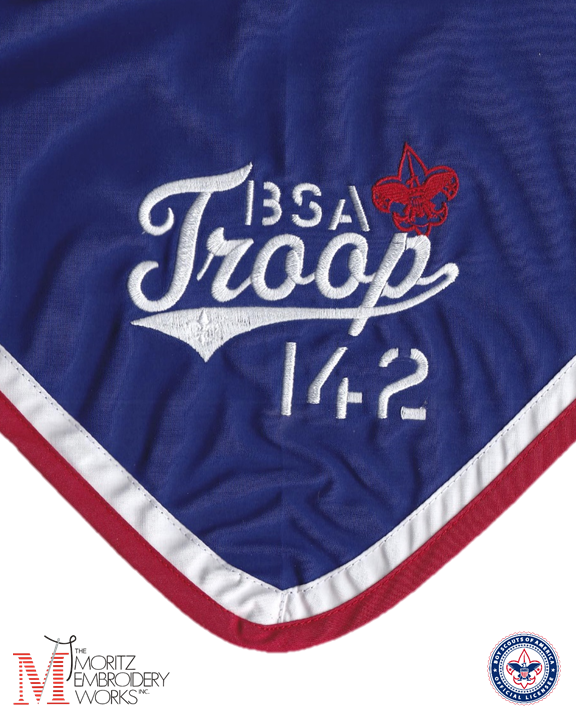 Our goal is to produce the highest quality neckerchiefs for Scouts at the fairest prices. 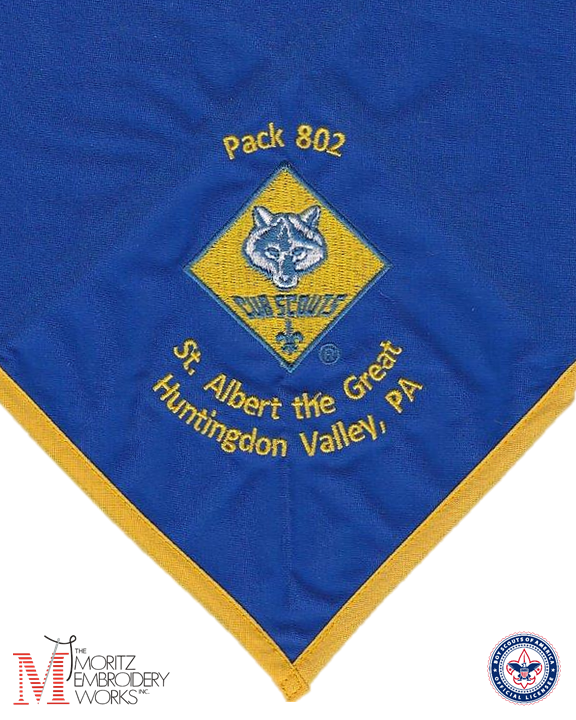 Let the Moritz Embroidery Works help you design a custom neckerchief for your Boy Scout troop, Cub Scout pack, Venturing crew, OA lodge, NYLT course, summer camp, or other special Scouting group or event! 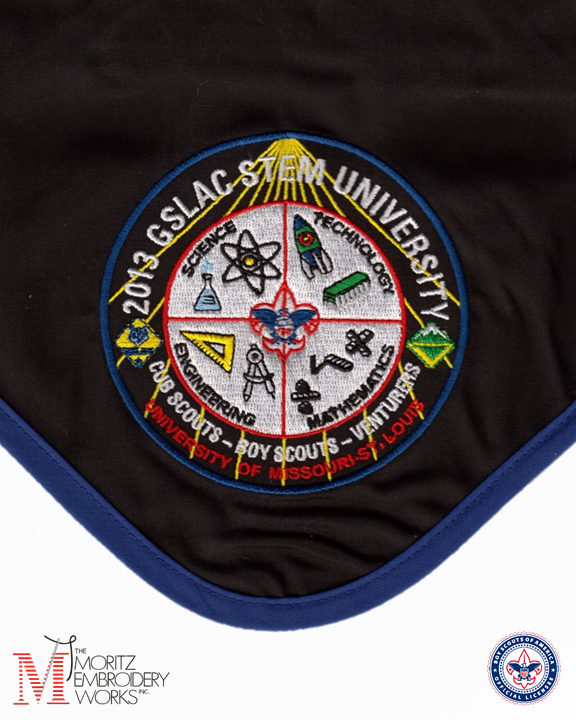 You can add your own custom text and unit numbers to one of our popular BSA stock designs, or we can create a truly custom neckerchief for you based on your own design or logo. You can pick your own colors – with hundreds of color combinations possible. All solid colors are available on our blank neckerchiefs with your choice of matching or contrasting fabric piping. Two-color body designs are also available. 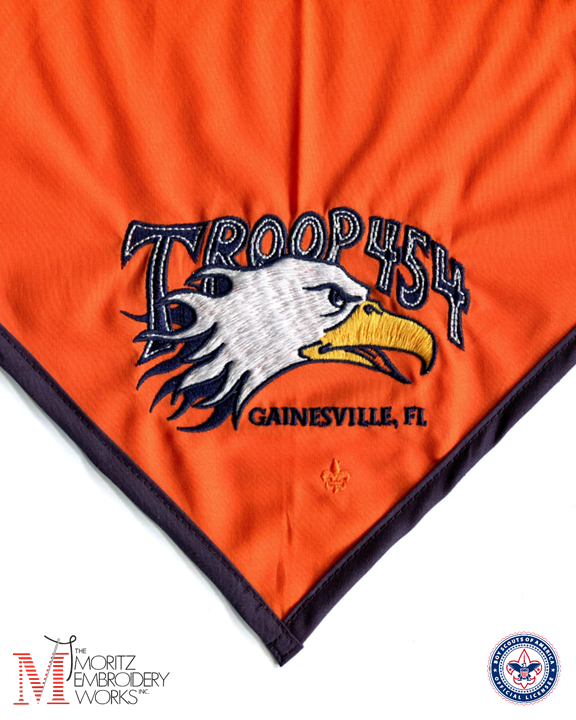 We also offer beautiful digitally-printed fabric neckerchiefs which allow for unlimited choices of custom patterns and designs. 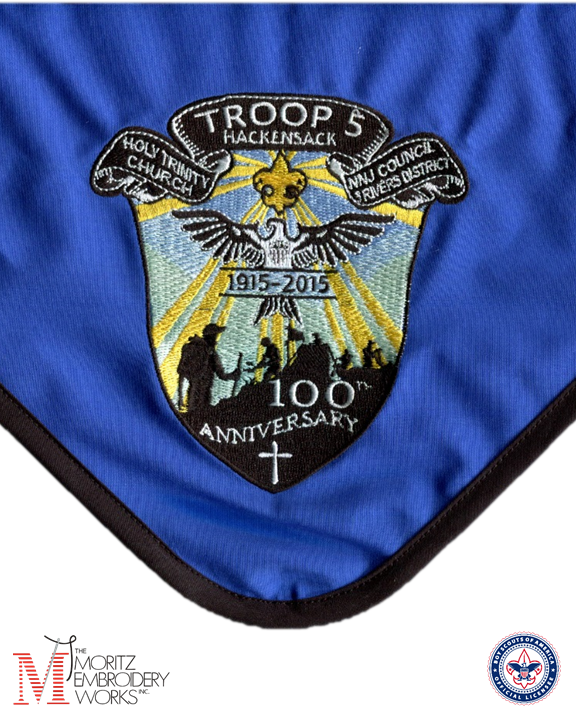 We are also proud to offer a wide variety of great custom neckerchief slides. 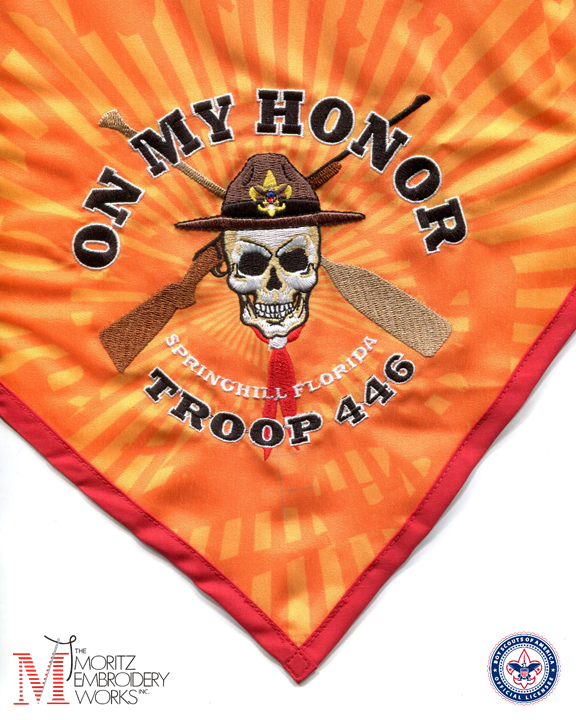 Look sharp holding your neckerchief together and show your unit pride with a custom neckerchief slide. We can provide you with a custom neckerchief slide to perfectly match any custom neckerchief. Call a Moritz Embroidery sales specialist at 800-533-4183 or request a price quote online today. You can view samples and shop our convenient collection of stock designs online at www.moritzembroidery.com. 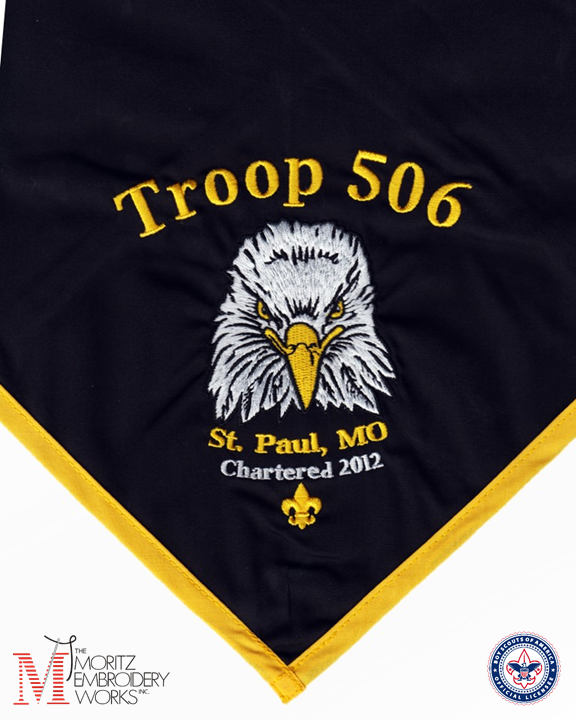 We’ll be honored to create a custom neckerchief that you and your Scouts will be proud to wear.